A car gets pitted by a large transport trailer and careens into the concrete barrier, smashes into the wall and ends up heading the wrong way on Highway 401 coming into Toronto. 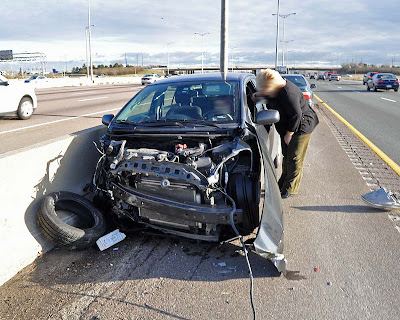 The car takes the punishment in the brutal crash and the front crumples, everyone avoids the car and debris and the driver walks away from the crash with bruises. Here is the anatomy of a car crash - from 100 km/h to 0 in a few short seconds. I have blurred parts of the pictures to keep the identity of the driver private. A concerned lady comforts the driver as the crumpled and exposed front end reveals the violence of the impact. 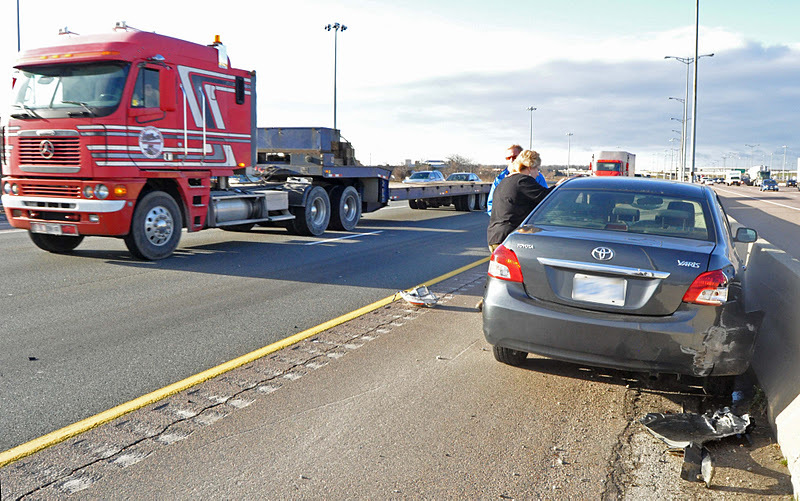 We were heading into Toronto following a couple of car lengths in the middle lane of a three lane 400 series highway. A truck was in the fast lane to the left and wanted to get into the middle lane. The truck went to turn into the lane but hesitated, we thought he had seen the car, but apparently not, because after the initial hesitation he moved into the middle lane - where the other car drove along merrily, unknowing of the danger that fast approached her carefree commute. Imagine that, driving along, one moment chugging along, peaceful, music probably playing, sun shining. 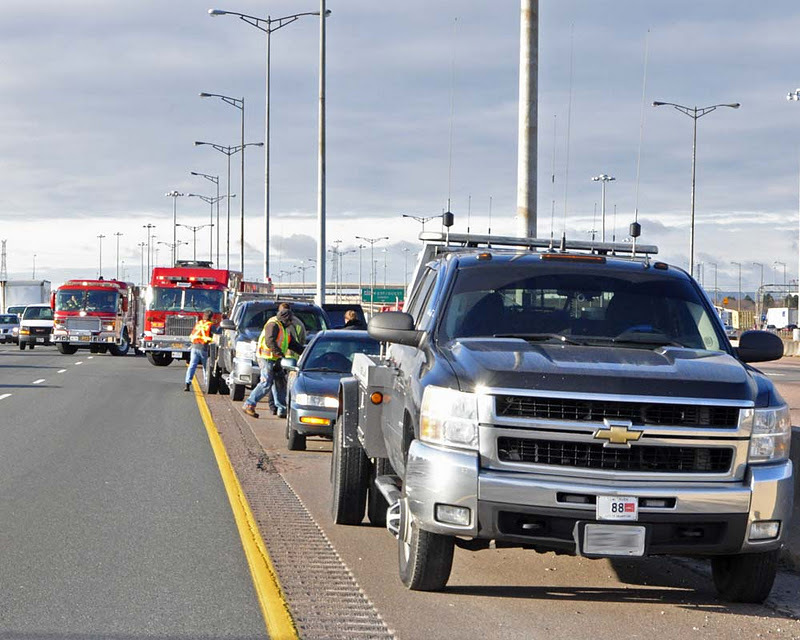 The next minute you are turned 90 degrees and are headed into a concrete barrier that approaches in slow motion, maybe you see the truck that caused the accident flash by to your side. The crash that slams your body into the airbag and your knees into the dashboard area. Miraculously the cars around the accident, including us, managed to avoid the wreckage and debris and no secondary crashes compounded the damage that spread along the paved shoulder adjacent to the barrier. We pull over to check on the driver where we find that she seems to be sore but otherwise okay. The smoking air bag was collapsed and there was no fire or other immediate danger so my brother calls 911 and asks for help while we all try to comfort the upset driver (a kind lady had stopped to see if she could render assistance as well) and I also move some of the debris away from the road. The truck continues on while witnesses call in reports of the trucks identity. 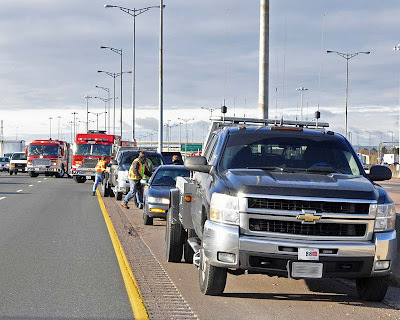 First on the seen was a tow truck, man those guys are fast, next came an OPP officer who came from the other side of the highway, followed by fire and ambulance. 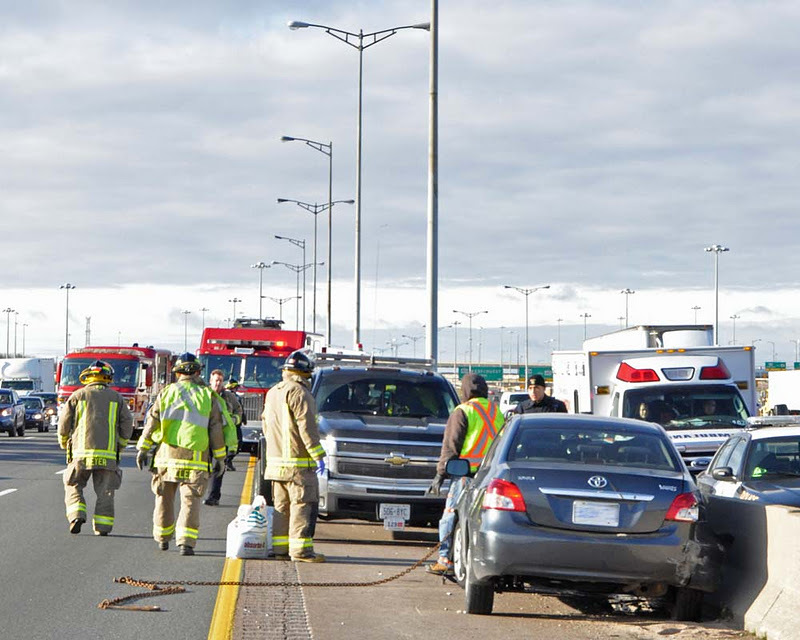 Lanes were quickly shut down and traffic forced into the other lanes as the wreckage is quickly cleaned up and the towed away to the first exit. My brother makes a witness statement and we see that the driver stayed with the tow truck. All told from car crash to witness statement we are talking about an hour. Traffic continues to flow passing by the damaged car which faces the wrong direction in a photo taken immediately after the crash and access the damage and request an emergency response. 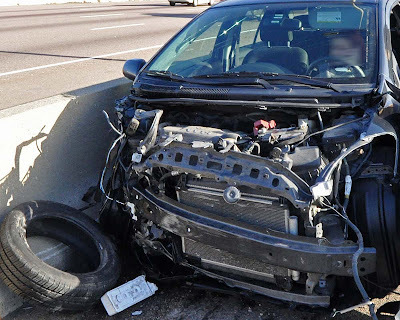 I find it truly amazing that the safety features that have been built into cars allow the vehicle to take the damage while keeping it's passengers relatively safe. Remember that when buying your next car. The highway safety feature also kept the car from crossing several lanes of high speed traffic in a direction that could not be anticipated by the other drivers - this concrete safety barrier really helped to keep the driver safe. It is also great to see people who care enough to get involved in helping others in times of need. 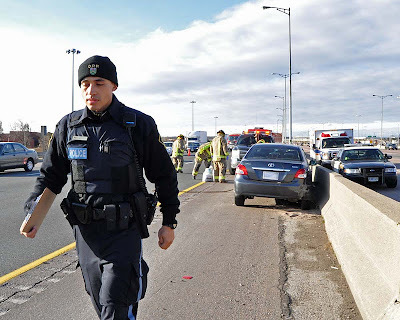 That lady that stopped to help was out in the cold, cold winter wind, not concerned with being late, and instead helped someone that was very emotional after such a dramatic turn of events that saw her car demolished.